24. bakery style chocolate chips. Our super cookie woman is here to make sure we don't run out of cookie ideas! great job Claudia, they all look wonderful! I always love your posts. 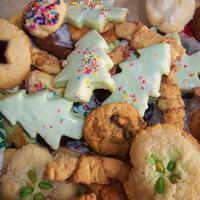 I'm intrigued with the great selection of holiday cookies, especially all the Italian cookies. Time to start baking! !